My deepest condolences to all the family members of Officer Rob Pitts, and to his brothers and sisters with the Terre Haute Police Department. May Rob's soul rest in heaven. Sending up prayers for your families, at work and at home. Thank you for your service, you will not be forgotten. Warm winds and blue sky’s. Rest In Peace Brother. Thank you for your service sir. May you Rest In Peace. Condolences to all that knew him. 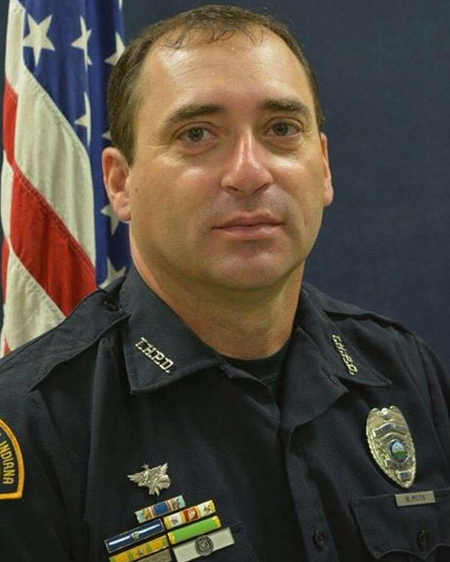 My sincere condolences to family, friends and Terre Haute Police Dept for the loss of Police Officer Rob Pitts, Indiana’s finest and most courageous in the eyes of the American people. He and others like him, out on the front line for our freedoms deserve our highest honor and Thanksgiving. May his soul, through the Mercy of God, Rest In Peace. May God's blessings engulf your family and fellow brothers and sisters in blue. You are a true hero. May the peace that passes understanding be with your department as they work through your sacrifice. I salute you. May the Lord comfort your family, friends and co-workers at this most difficult time. Deepest sympathy goes out to the family and friends of Officer Pitts who gave the ultimate sacrifice in the line of duty for his community and our Nation. May the peace and grace that God provides be your strength and help in the days ahead. I WILL KEEP HIS FAMILY AND FRIENDS IN PRAYERS. YOU WILL NEVER BE FORGOTTEN. I'M SO SORRY FOR THIS HORRIFIC LOST. Thank you for your service. Prayers for your Family & Department. May the comrades of PO Pitts use the feelings generated from this cowardly attack, against one of our brothers, as fuel to continue the fight against those wishing to prey on the weak. May the family find some measure of comfort from the embrace of their law enforcement family. May God hold PO Pitts in the highest regard, seated at his side, for his earned eternal rest. May God bless Officer Pitts, his family and colleagues. He now resets in the arms of our Lord along with so many brother and sister law enforcement officers who made the ultimate sacrifice. John 3:16 For God so loved the world that he gave his only son, that who ever shall believe in him shall not parish but have everlasting life. Thank you for your service Sir. Many prayers from CA to your family, friends and department. God speed to you. With respects, and you will never be forgotten. Terre Haute Police Department. You are lifted up in thought and prayers. May God comfort, hold you close and give you His peace that surpasses all understanding through Christ Jesus now and always. Thank you for your service. John 15:12-13 / Matthew 5:9. Rest in peace brother. We have the watch from here. Thank you Officer Pitts for your dedication and for paying the ultimate sacrifice for the fine folks in the great state of Indiana. You are a true AMERICAN HERO !!!! My thoughts and prayers are with your family, friends and co-workers. May you forever, rest in peace, my brother. Rest in Peace Officer Pitts. Thank you for your service. My thoughts and prayers are with the Pitts Family and the Terre Haute Police Department. My condolences to the family of officer Pitts and his co-workers at Terre Haute PD. Thank you for your service sir. Your sacrifice will not be forgotten. God Speed.